Come enjoy an October afternoon with us at Stonoview! We’re hosting a grand opening event for the new model home recently built in our Johns Island community. 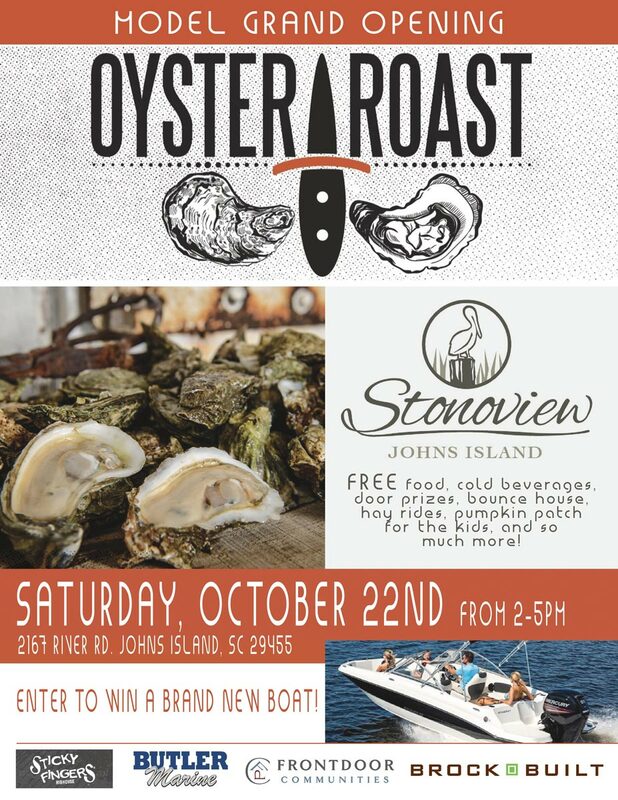 Now that the months with “R” in them are back, we thought that having an oyster roast would be a perfect choice for this occasion in our Charleston area community. You will love this neighborhood’s location on the Stono River especially while the beauty of Autumn is all around. This time of year, there’s nothing like shucking oysters next to an outdoor fire on a cool Charleston afternoon. We definitely want you to come out and join us for this Grand Opening. We’ll have food, cold beverages, and fabulous door prizes that our Stonoview community guests will have a chance to win.The event will be held on Saturday, October 22nd from 2-5pm. Drive over to Stonoview on Johns Island just minutes from downtown Charleston and meet us at our new model home on 2167 River Rd. Johns Island SC 29455. Also, you don’t want to miss out on this! Butler Marine will hold a drawing for the chance to win a Brand New 2016 Key West Boat valued at $30,000. A lucky attendee could drive away from this event with a new boat in tow. The drawing will be held at 4pm and you must be present to win. Plus for the kids, we’re planning to have an inflatable bounce house and with Halloween only a week away from our event, we’re providing a pumpkin patch for the children free of charge! We’ll have 150 pumpkins delivered from Joseph Fields Farm on Johns Island, so children in attendance can take home a pumpkin for carving. Of course, what’s a pumpkin patch without hay rides? That’s right, we’ll have those too for families and attendees to enjoy while they tour the community. We want to thank our wonderful sponsors in advance for their support and contribution to this upcoming event on Johns Island. Without them, this spectacular new model home Grand Opening celebration would not be possible. Lead homebuilders, designers, and developers of this master planned neighborhood on Johns Island, Brock Built invites everyone in the Charleston area and beyond to join us for this model home grand opening. If you’re thinking about buying a new home in Charleston or currently shopping for one then you should definitely join us. We know you will fall in love with this property, the home designs, the resort-style amenities, and the fabulous, relaxed, Lowcountry lifestyle available. See all the new homes we have available here and ask our onsite agents for more details on how we can customize your new home in Stonoview. Earlier this year, Stonoview welcomed these southeast builders to our Stono River community as designated builders on 20 beautiful new homesites. Led by a team of dedicated professionals with more than 25 years of proven experience, Front Door Communities currently have 4 homes available starting in the high $400s, with more to come. Our friends at Butler Marine of South Carolina are the best full-service boat dealers for residents in Charleston, Beaufort, and other surrounding areas. They offer an awesome selection of boats for sale, on both new and used models. During the event, they will have boats on floating display located down at our deep-water community dock for you to check out. Visit their online showroom now and don’t forget to ask about how you can enter to win a brand new boat.